April Fools’ Day is the time for witty jokes and pranks all over the world, and the tech industry is no stranger to using it for generating some publicity. Google is at the forefront in the buffoonery business yet another year, this time with a dedicated top-level domain. Go ahead and type com.google, to see for yourself what they did, but be prepared for an eye-twisting experience. Now that’s just the beginning though. Google Fiber has a brand new feature to offer which aims to pull the brakes on our hurried lives and takes us back to simpler times – Dial-Up mode. Google Maps is even more fun today and lets you play real-world Pac-Man! Well, sort of. You choose a random area on the map and hit the Pac-Man icon in the lower left, next to Earth. The engine zooms you to the proper level and draws the setting for the iconic arcade game, say in downtown San Francisco, complete with ghosts and cherries, and all. Google Japan went all out and “launched” a new product – Google Panda. The furry stuffed animal is another take on the personal assistant theme, bringing cuteness to smart devices. More in line with what you would consider typical Japanese humor, Google gives you the Keyless Keyboard. A smart party horn, it allows for handsfree input by translating the force of your exhalations into symbols. A nose-operated version is in tow, for when your mouth is occupied with other tasks. “Back to the roots” is apparently a common subject for Google with Smartbox, the physical mailbox of the Internet generation. It sends notifications to your smartphone when you have snail mail, keeps your letters warm and cosy and wards off spammers. Meanwhile, the company’s Youtube subsidiary chose not to rickroll you this time, but sandstorm you instead. Regardless of what you’re searching for, the search engine returns the same suggestion, and if that’s not enough, you can even overlay the track’s characteristic intro over your currently laying video. Microsoft played on its heritage and announced MS-DOS Mobile – 1980s on your Lumia smartphone, who wouldn’t fall for that. 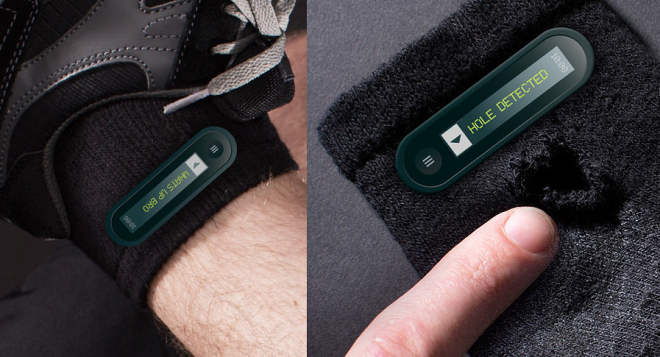 HTC introduced the re sok smartsock, because all things are getting smart and smarter. It offers SMS viewing on your ankle, GPS connection and the headline feature – hole detection. 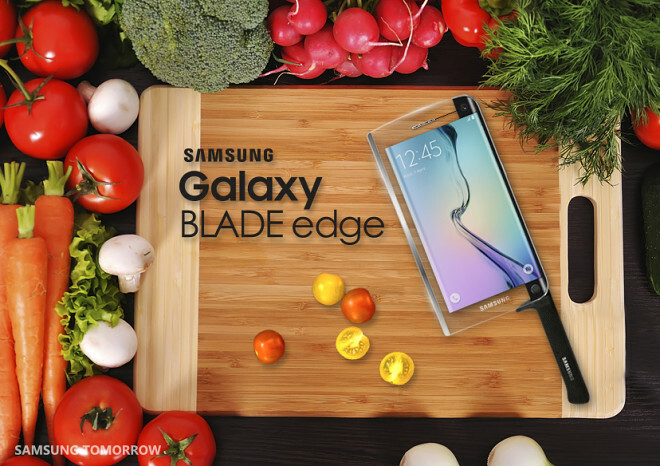 Samsung chose to make a pun out of its scorching-hot Galaxy S6 edge flagship and take it to the kitchen for a quick veggie-cutting session, complete with a gourmet camera mode. Plugging in an extra Exynos chipset in your smartphone’s USB port is also not out of the question, Samsung claims, at least today. 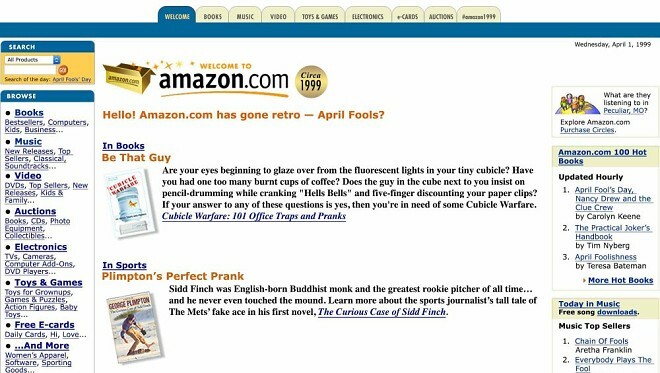 Amazon too rides the nostalgic wave and greets you with a screenshot from last century. A very comprehensive example of self-mockery comes our way from Imagination Technologies, the British semiconductor company, most widely known for its PowerVR graphics cores. 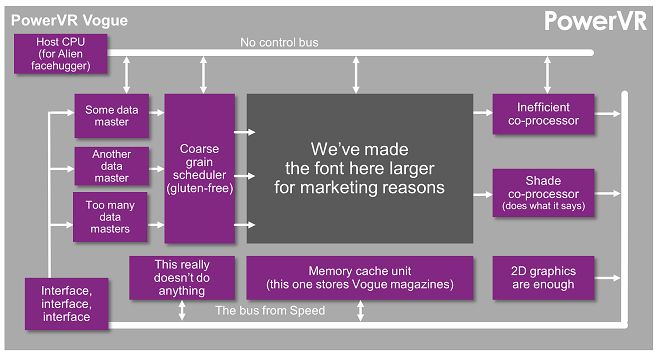 The architecture of their new Crysis-running GPU is shown below, but for the complete picture you’d best visit their own blog. That’s what’s caught our attention – if there’s anything else you spotted feel free to share it in the comment section below.